Filipe Cortez, Old São Roque slaughterhouse in Porto, Portugal (2016).Courtesy of the artist. inCube Arts is pleased to present Filipe Cortez: Ecdysis, a solo exhibition that brings together the artist’s latest project and the first time present in the United States. Filipe Cortez is featured as the first artist in our inNext Program, for which inCube Arts shall select a single artist per year by our committee and provide the artist with a solo-exhibition opportunity at our space. Filipe Cortez’ new project “Ecdysis” has as main subject the old São Roque slaughterhouse in Porto, the artist’s native city in Portugal. The building, abandoned over two decades ago, will be renovated in 2017 into a new center that will house the Industry Museum with a strong cultural, social, and entrepreneurial program. This ambitious project has been the central focus of the current municipality regarding culture and the repurpose of a municipal space. The artist constructs a collection of memories of the space, creating an archive of the architectural heritage that also contains its past life as slaughterhouse. He intends to capture the present moment before the restructuring of the building, which is going through a transition phase comparable to the ecdysis process of a reptile or insect. In the same way that these need to change their skin to continue their growth and development, the São Roque slaughterhouse will suffer a profound transformation from place of butchery to cultural space. Parallel to the animal skinning process that used to occur there, the work resembles a skinning of the building itself, generating a collection of “skins” as direct prints, in negative, of the old slaughterhouse’s walls. The latex coats contain not only the form and texture of the wall, but also residues, pigments, and other inscriptions of its past. The manufacture of a false skin reflects the logic of taxidermy techniques, where a body is preserved avoiding its disappearance. The artist seeks to preserve the memory of the building before its complete death as slaughterhouse. The proposal brings that retention to New York City in physical and tactile form, allowing the public a close contact with the space’s history. The exhibition becomes the visualization of that recollection, usually invisible, in the form of a shell or mortuary skin of the slaughterhouse, putting in proximity the skin of the building and the skin of the viewer, so that the memory contained in the pieces can be materially experienced. 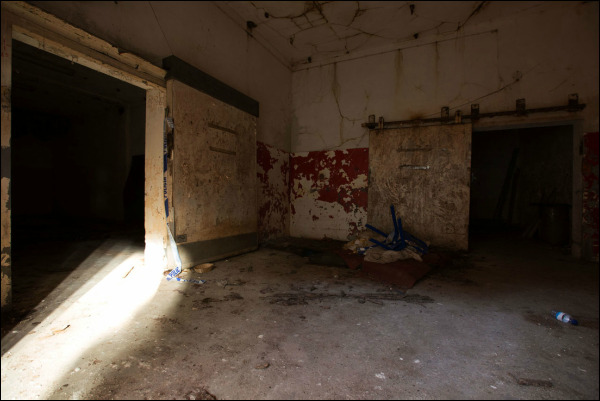 “Ecdysis” raises questions about rehabilitation processes of abandoned or closed buildings, an extremely relevant issue in contemporary Portuguese urbanism. This debate is also particularly interesting in New York, a city that reinvents and rethinks itself in a constant urban transformation, where the impulse to preserve has in general less strength than for instance in a European context. Cortez pays a tribute to a space and its history, without wanting to stop time or feeling nostalgia for the past. The work functions more as an endpoint, prompting a pause to contemplate and reflect before the upcoming chapter. Filipe Cortez (Portugal, 1986) lives and works in Porto. He holds an MA in Painting from the Faculdade de Belas Artes da Universidade do Porto graduating with honors and a BA in Painting from the same institution. He exhibits regularly since 2007, highlights being his recent exhibitions in New York City and the one scheduled for next year in Taipei. In 2015, he completed a six-month artist residency at Residency Unlimited (New York) from where many collaborations with galleries and curators developed. Filipe works within the fields of painting, sculpture, and site-specific installation exploring memory and time in architectural spaces. The multidisciplinary use of media has become a constant in his work, which has received various awards and honorary mentions. Special thanks to Residency Unlimited (RU) .